Leather is one of the most original materials available. 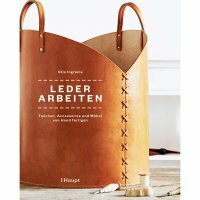 In this book, Otis Ingrams explains the art of making exquisite bags, sophisticated furniture and stylish accessories. After an overview of the materials and the most important traditional tools, the manual techniques are illustrated. Sewing, braiding, weaving, folding, riveting and wet shaping of leather are introduced step by step through 20 projects: from handmade wallets and elegant belts to various bag designs and a chair with braided leather seat.